Much like this week’s midseason finale of The Flash, Arrow’s midseason finale would begin with a flash forward. Though this flash forward would persist throughout the episode while also accompanied by the patented Arrow flashbacks. Shocking revelations, familiar faces and a final dual that was expected and yet completely mind blowing. Let’s take a closer look at Arrow’s midseason finale “The Climb” and see just what could possibly be in store for the rest of the season. As the title suggested, this episode was all about “The Climb” – and no, not the Miley Cyrus song. Though it was more than just Oliver’s physical climb up the mountain to face Ra’s; but also how the episode itself that slowly built to this climax. As the episode progressed, the emotions and shocking revelations climbed higher and higher as did Oliver’s climb – which we were constantly reminded of with the flash forwards carefully placed throughout the episode. Additionally, this image of ‘The Climb’ also represents an seemingly impossibly challenge; and this episode showed that as each central arc represented someone facing/dealing with an incredibly difficult choice. Whether it was Oliver’s shrinking window to find Sarah’s killer, his impending fight with Ra’s, coming to terms with Malcolm’s manipulation of Thea, or Laurel breaking down more and more over the weight of Sarah’s murder, various characters found themselves in uphill battles. Malcolm’s Diabolical Yet Flawed Plan? Way back at the beginning of the Season, I had actually suspected Thea’s involvement in Sarah’s murder. We know that it was someone Sarah recognized and felt safe around. Thanks to Thea’s training with Malcolm, her abilities – even though no where near that of Sarah’s or Oliver’s – would be good enough to take Sarah by surprise, thus giving her the element of surprise/being underestimated. Though despite my feelings, I never really pushed the issue too much after we saw Thea and learned how much she didn’t want to return to Starling. Additionally, her motivations never made much sense. 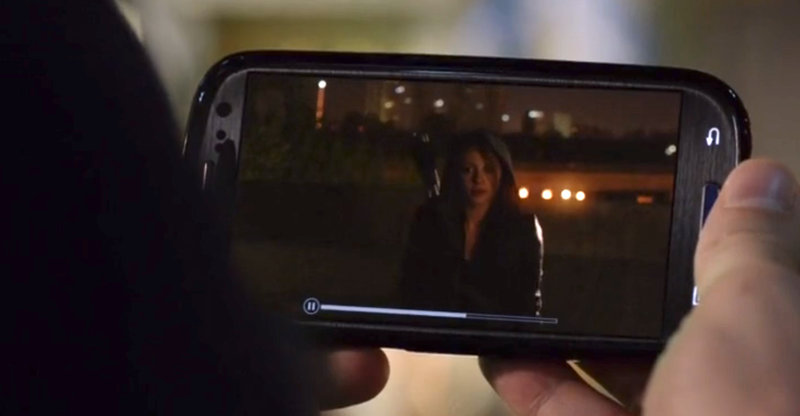 I guess you should always trust your gut because it turns out Thea WAS the killer. After being drugged by Malcolm and open to suggestion, she went with him to Starling and killed Sarah. All of this was part of Malcolm’s plan to get Oliver to fight Ra’s al Ghul in order to save his sister. With Oliver defeating Ra’s, all blood debts would be forgiven, thus letting Thea – and Malcolm – free. This truly shows how absolutely soulless and devious Malcolm is; but there is still one problem he seems to have overlooked: HOW could Oliver beat Ra’s? We saw Oliver get over powered by some of Ra’s assassins while Ra’s himself is later seen taking on a larger group of them effortless. In fact, our first mention of Ra’s was how even Oliver was scared of him. His reputation precedes him clearly. Oliver feels that he’ll be able to win because he knows what he’s fighting for; but the problem here is that ‘not knowing what he’s fighting for’ is why he couldn’t beat Malcolm at first. Now Oliver knows, so he can defeat Malcolm. Ra’s is on a completely different level. How could Malcolm not take this into consideration – or did he, and we just haven’t seen it play out yet? We’ve seen Laurel struggle with Sarah’s murder all season. She’s been impulsive, reckless, vengeful and everything in between. Though now that the holiday season upon us, Laurel is finding things especially difficult as she feels the full weight of this dreaded secret. She still refuses to tell her father; yet now Thea and Laurel’s mother both know about Sarah’s death. We know what will happen to Laurel at the end of all of this – becomes the Black Canary – but what about Quentin. Will he truly take the news as badly as Laurel fears or will Laurel having kept this from him hurt the most. A couple episode ago in “Guilty” we saw how Oliver kept Tatsu’s red candle in his crate of tricks. The Hood, miracle herbs, arrow head. All of these items we’ve seen Oliver take out of that box have special significance to those he learned from and what he had to do on the island. Hong Kong shouldn’t be any different, which means there is a particular tragedy tied to this item as well. Well the flashbacks this episode not only served to establish the ‘brainwash’ herb Malcolm Merlyn used on Thea; but also to reaffirm and set up what tragedy is about to befell Oliver’s Hong Kong chapter. When Oliver meets Maseo again in the present, he finds that he has renounced his old name and goes by “The Phantom” now. Oliver also assumes that Maseo came here after “IT” happened. We don’t know what it is; but from the way the flashbacks are going, you can be sure something terrible is about to happen and Maseo’s family is in the center of it. Every hero – and villain – needs motivation. In order to do huge deeds, you need a huge push; and this episode gave us Ray Palmers. For a while we were confused why a tech guy wanted to buy Queen Consolidated so badly. He didn’t seem the hostile takeover type. Well it turns out that during the attack on Starling City by the Mirakuru soldiers, Ray watched helpless as the woman he loved was killed. Wait a second, sat helpless while wife was murdered . . . sounds so familiar. Despite Ray’s motivations being INCREDIBLY similar to that of Malcolm Merlyn’s, Ray seems to be doing honest good because of it. No crazy massacres or plans for vengeance; but rather wants to honor his beloved’s memory by protecting people. YUP, Felicity’s got a type! So just what is he planning? Well he is hoping to centralize various weapons systems into one suit, which was originally named O.M.A.C. but he changed to A.T.O.M. It’s important to note that while The Atom is a superhero, OMAC was a computer system/super solider program that became a tool in hunting down Metahumans – think Sentinels for X-Men. Is this just a simple nod to another comicbook reference or will this system somehow be used to evil at one point? Way too soon to tell; but sometimes the best intensions have the worst consequences. Perhaps Ray is inadvertently creating one of his new enemies. 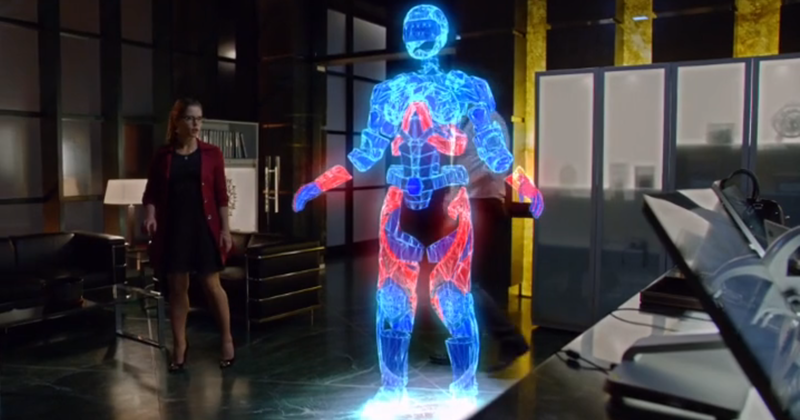 Now whereas the series writers haven’t explicitly said that the magical springs of rejuvenation exist in the Arrow-verse, they did say that there is a way for it to make sense. Remember, we had Mirakuru, the magical drug that could revive you and then make you incredibly powerful – at a cost though. The Lazarus Pit could work very much the same way and speed up healing. Though as with all stories of the Lazarus Pit, there is usually a side effect – whether long term or short term. We don’t yet know how they’ll be written in; but lets face it: If miracle super soldier serums and mind control drugs are possible in this universe, so too are Lazarus Pits. Is Oliver Queen dead? HAHAHAHAHAH Please, any character in this show is fair game EXCEPT Oliver – he is the title character after all and the season isn’t even over. Though how could he possibly survive getting run through with a sword, pushed off a high cliff and exposed to the elements without so much as a tshirt on? Well, it did look as though Ra’s knew Oliver was lying to protect someone. Heck, he might even respect him for doing so as well as getting in a few good hits – ok one good hit. To whatever extent, Ra’s does respect Oliver – as seen by not caring if he kneeled before him or not – but does that mean he’d take it that easy on him? Well somehow or another Oliver survives; or does he? With the possibility of a Lazarus Pit coming into the fold, someone – possible Maseo – could find Oliver’s body and place him in to revive him. This idea would also make sense since we know Maseo and Oliver will have some unfinished business to get to concerning the flashbacks and what exactly went down – all we know is, it’s bad and probably means the slaughter of Maseo’s whole family. 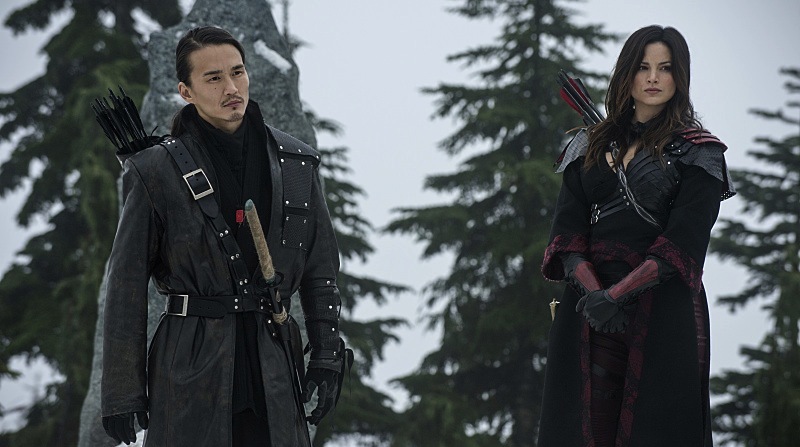 Though with Oliver brought back, that wouldn’t just mean a possible rematch with Ra’s – or battle with Malcolm -; but also two women hunting down Thea. Nyssa for certain would want revenge; but I’m currently more worried about Laurel’s reaction. Yes Thea wasn’t in control when she killed Sarah; but Laurel has already shown that she’ll fly off the handle when it comes to her sister’s murderer – Malcolm, Roy, etc. Could we see a Laurel vs Thea fight in the future? It’s always nice to keep track of the time frame between Arrow and The Flash since they both take place in the same universe. Even last week’s crossover episodes took place a week apart from each other. So what about this week? Well, we know Oliver’s battle with Ra’s took place 48 hours after the episode began. Later in the episode – at the start of the 48 hours – we not only hear Felicity talking to Caitlin Snow; but also see a newspaper clipping about The Man In The Yellow Suit attacking Star Labs. SO, this episode of Arrow basically starts the day after the attack on Star Labs – the day of Barry’s and Joe’s Christmas Celebration – and ends 48 hours later. As for a specific date, that’s a little hard to decipher; but we know this is all taking place at most a day or two before Christmas – if not Christmas Eve itself – considering Laurel’s mom coming into town. In the teaser for next season, we do see Oliver lying – basically – dead in the snow and someone approaching him. Could that be Maseo about to take his old friend to be revived? Considering Maseo know Oliver didn’t kill Sarahand didn’t want to watch him die, I think so. Either way, we only have to wait about a month until new episode. That’s right! None of this late February/March stuff that other shows are making us sit through. Arrow will return Wednesday, January 21st.